The CHOP SHOP BLOODY WALL SCENE SETTER Butcher Meat Market Bloody Horror Theme Prop Gory Scenery Wall Banner Halloween Costume Party Decoration. Creepy Haunted House Photo Booth Backdrop Background. 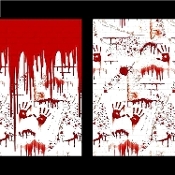 Spectacular decor printed with bloody hand prints, drips, splashes, spatter, pvc plastic wall rolls. Decorates TWENTY-feet Long by EIGHT-feet High wall. Shall it be a rack of ribs? A loin or two? Or maybe shoulder? A human shoulder that is! The Chop Shop Bloody Wall Scene Setter quickly transforms your room into a bloody butcher shop, zombie apocalypse site, CSI murder scene, or mad doctor morgue autopsy room. The plastic sheets attach easily with your own double-stick tape or similar adhesive materials. (Tape NOT included) Use indoors or outdoors to set a scary scene. Package includes 2 pvc plastic vinyl rolls, enough to cover a wall 20 feet long by 8 feet high. Two stackable, upper and lower wall, room rolls: Each roll is 4-ft (1.2m) high x 20 ft (6m) long to create a total room setting 8-feet (2.4m) high. This wall scene will decorate ONE-TWO walls up to TWENTY FEET.